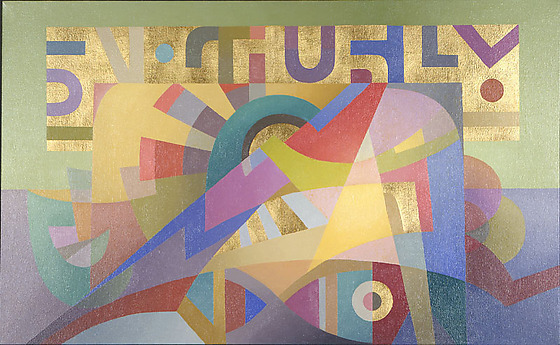 Abstract of overlapping, layered shapes in hues of blue, purple, red, yellow, green and gold. Gold pigmented rectangle with multihued "lettering" design on green background, top. Gold pigmented forms at center and lower right. Bisected circle of pink and gray within gray and gold ring. Purple rectangular form, lower left corner, blue hued rectangular form, lower right corner.